Another card has been revealed from Hearthstone's upcoming expansion, The Boomsday Project. Myra Rotspring is a legendary Rogue minion that will be introduced next month. It's a five-mana minion with four attack and two health, and it has the Battlecry ability to Discover a Deathrattle minion and gain its Deathrattle effect. This new legendary minion could fit right in with a longtime fan-favorite archetype—Deathrattle Rogue. But Myra Rotspring does cost five mana, and two health means this card won't be able to withstand many attacks. Unless you're fortunate enough to Discover an amazing Deathrattle ability, this card might not provide much value for its mana cost. 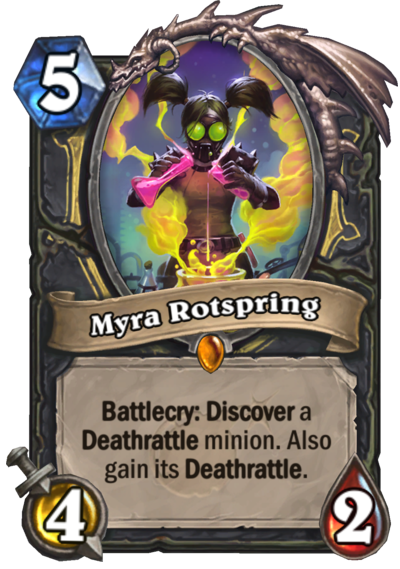 It's still too early to tell how good (or bad) Myra Rotspring will be, however, since all of the expansion's cards haven't been revealed yet. The Boomsday Project is the second Hearthstone expansion of the current Standard year, the Year of the Raven. It'll add 135 new cards to the game, including new keywords like Magnetic. This expansion can be preordered, and all of the cards will become available on Aug. 7.